The length of time it will take you to grill hamburgers depends on a variety of factors, including burger thickness, doneness desired, and whether or not your burgers are fresh or frozen. But, having an idea of different grilling times (and how to check for doneness) is helpful to ensure your burgers are grilled to perfection every time. The information in the chart above is for fresh hamburger patty meat. If you prefer to grill frozen burgers or simply don't have time to thaw out burgers ahead of time, you can still grill them but be sure to add on additional time -- and cook on a medium setting instead of high. Keep in mind grilling time may double for frozen hamburger patties compared with fresh hamburger meat. For example, when grilling a 1/2-inch frozen hamburger patty, it may take 12 minutes to cook to medium doneness -- but check for doneness at about 10 minutes. When grilling a 1-inch frozen hamburger patty, it may take 20 minutes, but check for doneness a few minutes early to avoid overcooking your meat. If you're grilling hamburgers indoors without a cover on your grill, grilling times may double. Outside, grilling times will also increase when you don't have a cover. Chowhound notes the timesaving and uniform cooking with a closed lid and recommends an approach that utilizes both open and closed lids at various points in the cooking process. Real Simple advocates using a closed lid with gas grills and open with charcoal. When grilling hamburgers using the chart above, use high heat. If you choose medium-high or medium heat, plan to cook your burgers for longer time periods to reach desired results. You should only need to flip your burgers once when grilling. You can flip more often if you'd like to, but this isn't necessary when grilling burgers to perfection. Flip the burgers about halfway through your desired cooking time. 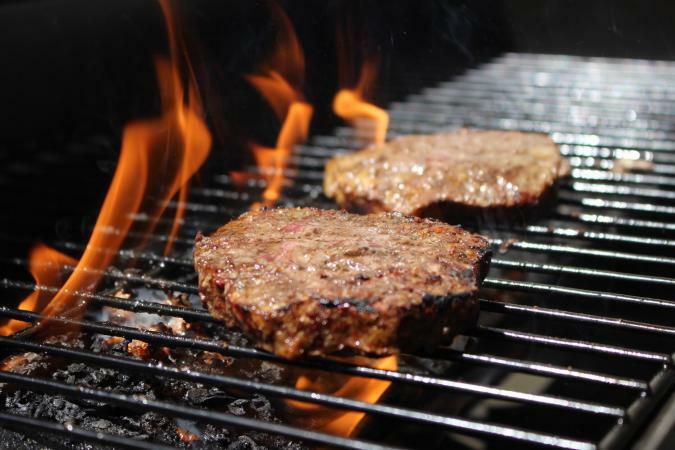 To make sure grilled burgers are safe to eat, check the meat's internal temperature. Beef should be cooked to a minimum temperature of 160 degrees Fahrenheit to reduce your risk for food borne illness, suggests the U.S. Department of Agriculture (USDA). You can use a meat thermometer to check for this. When cooking burgers to a desired doneness of medium well or well done, juices from the meat should run clear (not red). You can also visually check burger patties for desired doneness by cutting them in half and looking at the center of the burger. Of course, the temperature of the grill won't matter if you don't have the right meat, preheat the grill, or practice food safety. Because red and processed meats have been shown to boost chronic disease risks, pick hamburger patties with the least amount of fat marbling possible (the leanest patties you can find) to optimize your health, as animal fat is mainly made up of saturated fat. But for a richer, juicier-tasting burger, try patties containing 80/20 or 85/15 lean to fat ratios. Visually inspect the meat for freshness,and be sure it's sell-by date hasn't expired. For best results, preheat your grill (with the cover on) for at least five minutes before placing hamburger patties on the grill to be cooked. To prevent food borne illness, avoid cross contamination (of other foods and surfaces) with raw ground beef before it's fully cooked, don't let raw meat sit in room temperature, and don't refreeze thawed meat. Making a great burger on the grill shouldn't be hard. Use the temperature chart to help you make the best burgers around.